At this point in the law school admissions cycle most people have been accepted to multiple places and are waiting on a few more. What financial steps should you be taking now? Educate yourself about how law school financial aid works and what you should know about it. AccessLex, a nonprofit, offers excellent free online resources to help you calculate your student loan costs, understand the types of aid offered, and plan your law school budgets. Check out their excellent guide Financing Your Legal Education here. We also have paper versions of this guide in the office if you’d like to stop by and pick one up. They are also offering a free Financing Your Legal Education webinar; click the link to register . Subtract the scholarship amount from this tuition estimate. Now look at the living expenses budget provided by the school and add this in, assuming a 3-5% increase each year. What is your actual OUT OF POCKET expense for attending each school to which you’ve been accepted? Add your final tuition costs together with your living expenses to estimate this. These are the numbers you should be considering and presenting to law schools when asking for reconsideration of your scholarship package. Show that you’ve done your research. Apply for other scholarships. In addition to scholarships from the law school, there are many other scholarship opportunities for which incoming law students are eligible. Check out our database of 286 scholarships (many for law students and some for continuing undergrads) over on our Compass page! ABA’s Legal Opportunity Scholarship–Awards $15,000 over 3 years of law school to selected students. Applications are now open and due April 6. Ankin Law Office Annual $1,500 Scholarship–Awards a $1,500 scholarship for the best essay responding to their essay prompt. Due July 15. Whistleblower Lawyer Legal Scholarship Award–Awards $1000 to a first-year law student based on a published (in written or digital media) writing sample. Applications due May 1. The Law Office of William W. Hurst, LLC Scholarship–Awards $500 to students with an interest in law. Preference is given to those entering their first year of law school and Indiana residents. Applications due July 31. Brian Zeiger Scholarship–Awards $1000 to a student based on an essay about juvenile crime. Applications due May 25. Learn how to effectively and respectfully negotiate your scholarship offers. 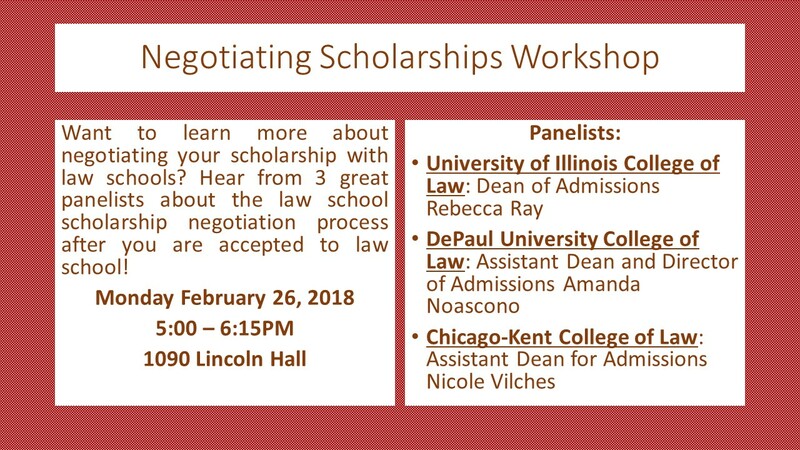 Join us for a Negotiating Law School Scholarships workshop in which a panel of law school deans share their expertise on February 26 at 5:00 pm in 1090 Lincoln Hall. What should you ask? What should you avoid saying? What are effective reasons for increasing aid, and what is a nonstarter? 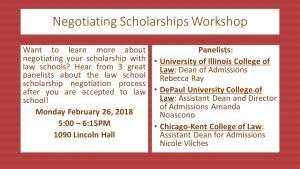 Find out from the deans of the University of Illinois College of Law, DePaul University College of Law, and Chicago-Kent Illinois Institute of Technology College of Law. Click here for more details. February is here! Sadly, per the famous groundhog Punxsutawney Phil, we still have to endure several more weeks of winter. Now is a good time for those of you in the midst of the application cycle to think about a few things. April has lots of great programs, workshops, and deadlines, so take a close look at this week’s Mark Your Calendars. 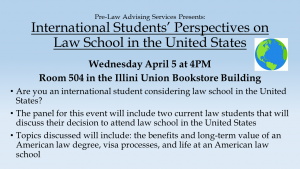 International Students’ Paths to U.S. Legal Education — Wednesday, April 5, 4-5pm, Room 504, IUB. Are you an international student considering law school in the United States? Join us for this panel. 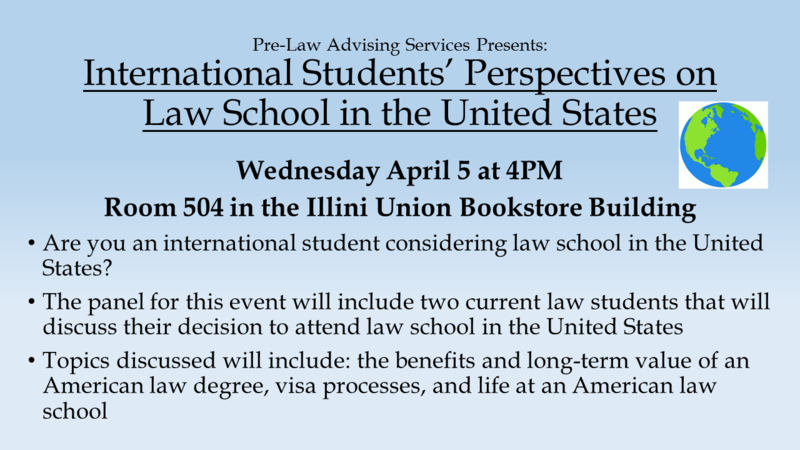 Two second year law students from the University of Illinois College of Law, one originally from China and one originally from the Ukraine, will be answering your questions about attending law school in the United States. Topics discussed will include: the benefits and long-term value of an American law degree, researching your options, visa processes, skills & experiences that are most helpful for employment after law school, and life at an American law school. No registration necessary. Are you headed to law school this fall? 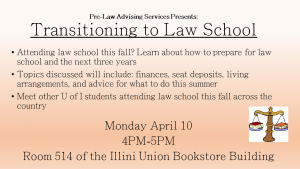 Join us for Transitioning to Law School on Monday, April 10 at 4:00 in 514 Illini Union Bookstore Building to learn what you need to know before heading off to law school! From finding living arrangements to what to buy/get or get rid of, hear from current law students what they wish they’d known before starting law school! Join the Pre-Law Honors Society TONIGHT at 6 pm in Lincoln Hall Room 1028 where Professor William Ford from John Marshall Law School will be talking about the application process and about The Use of Trademarks in Video Games. All are welcome! Thinking of taking summer classes? Enroll now! There are lots of options for both class based and online courses. One class that might be of interest to pre-law students is Law 199: The Best of American Case Law. This is a 10-day summer course designed to introduce students to some of the most important and exciting law school cases. Students will come to understand how the law school classroom works, experience a broad sample of at least eight different areas of the law, and engage with nationally renowned law faculty as they present some of the most important legal cases. All students will receive a certificate for successful completion of the course. 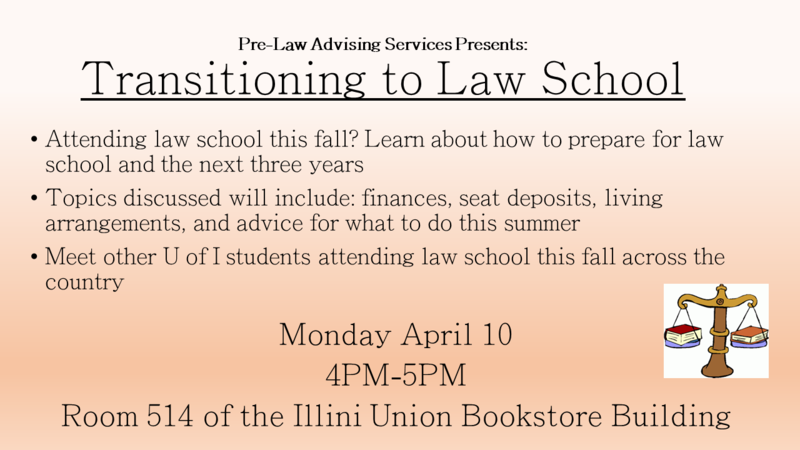 Current University of Illinois students will also receive 3 credit hours. Go here for more information: https://courses.illinois.edu/schedule/2017/summer. Interested in ideas for other Fall 2017 classes? Check out this PLAS blog for suggestions. Illini Career & Internship Fair — Wednesday, April 5, 2017, Noon – 5:00pm, Activities and Recreation Center, 201 E. Peabody Drive. The Illini Spring Career & Internship Fair connects you with top-notch talent at just the right time! Whether you are seeking to fill a newly opened position, have decided to hire a summer intern or have not reached your hiring target, consider participating in this “just-In-time” career fair. This fair brings together students from a variety of majors who have rich diversity, exceptional skills, and a breadth of experiences. The Office of Volunteer Programs is hiring PAID undergraduate office staff positions School year student employees work regular office hours as well as special events that occur in the mornings, evenings, and on weekends. Applicants must be enrolled in Fall 2017 classes at the start of employment. Starting pay rate is $8.25/hr. To apply: please complete an application at the Illini Union Employment website, and after you have filled out the form, send a cover letter that includes your interest in the position along how you will contribute to the success of the office; a resume; phone and email contact information for two references; and availability for a potential 30-minute phone/Skype/in-person interview during the next three weeks to John Race, Program Advisor, by email at jrrace@illinois.edu. Apply to be a Women in Leadership Intern. The YWCA of the University of Illinois is seeking Women in Leadership interns for the 2017-18 school year. Women in Leadership is an intensive, two semester leadership and project management internship. Structured as a group consulting project, the program allows interns to work directly with local human services agencies to learn about the nonprofit sector; identify organizational challenges; and research, propose, and implement solutions. Throughout the year, interns receive training focusing on professional development, leadership skills, and building a working team, all of which are applied to their projects. Interns are guided through this process by mentors drawn from Urbana-Champaign’s excellent professional and graduate student pools. Open to all UIUC students. For more information, please contact Amarin Young at amarin@ywcauofi.org. To learn more and apply, visit: www.ywcauofi.org/womeninleadership. Applications are due April 30th. We hope that you have been keeping up on our blog and Facebook posts about internships and summer pre-law programs. Time is slipping away – summer will be here before you know it so if you don’t have anything set, now is the time to work on securing something! Another resource you should continue to utilize is our 20 page Internship Newsletter over on our Pre-Law Compass page that we posted in December! (Click here for instructions on how to access our Compass page.) The Internship Newsletter has lots of job and internship listings for spring, summer and long-term opportunities from Champaign to D.C. and beyond. In addition, you should regularly check iLink to see if summer internships have been posted there. The Career Center has posted its spring workshop calendar on their website at: https://www.careercenter.illinois.edu/events. Now is a great time to update your resume, plan your job search or summer internship, and get to know their office and resources. Scroll down for information about that and other upcoming workshops. NEW–The Abraham Lincoln Marovitz Public Interest Law Scholarship is accepting applications until May 19. This scholarship awards $40,000 over 3 years to an incoming law student attending any Illinois law school who intends to pursue a career in public interest law. Click here for more details and to apply. The BARBRI & American Bar Association Scholarship will award $10,000 to an incoming law student and a $5,000 award to a runner up to help pay for the first year of law school. Applications due April 15. Click here to apply. The Aspiring Attorney scholarship awards $1,000 towards law school. Application due April 30. Click here to apply. The Earl Warren Scholarship awards $10,000 to entering law students for each year of law school (totalling $30,000). Applications due May 1. Click here to apply. The Lawson Law Scholarship provides $2,000 towards tuition for young Christian law students. Applications due April 30. Click here to apply. The Moses & Rooth Scholarship will award $1,000 to an incoming 1L student. Applications due June 1. Click here to apply. The O’Connor, Runckel & O’Malley LLP Scholarship will award $1,000 to an incoming law student. Must demonstrate proof of acceptance to law school. Applications due July 15. Click here to apply.